Assam babi is Chinese-Malay fusion, speciality of Nyonya cooking. The pork has a lovely tangy taste of tamarind combined with spice mix and fermented yellow beans is quite tasty with plain rice, comfort food for the cooler weather. 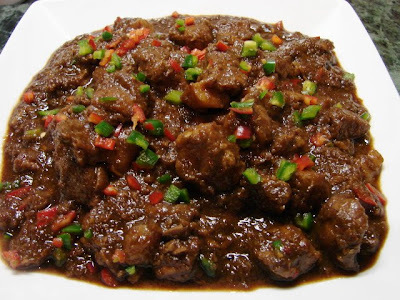 This braised pork is similar to this Burmese pork curry or a Chinesey rendang. This recipe is enough for 3 people or over 4 - 5 people as part of meal with other dishes. Cut galangal and shallot into small pieces. Put all the spice paste ingredients into a mini blender with few tbsp of water and blend to a smooth paste. Soak the tamarind with boiling water, let it cool for a bit then squeeze with fingers to release the pulp then strain. Stir and cook the spice paste with oil for 2 - 3 minutes, then add the yellow beans lightly crushed the beans with the back of the cooking spoon or spatula. Add lemongrass continue stirring for a little bit longer till fragrant. Add pork and stir for few minutes, add soy sauce and tamarind juice. Let the liquid boil then turn the heat to lowest, cover and simmer till the pork is tender, about 1 hour. Add sugar and salt to taste. If the sauce is too runny, raise the heat uncover and reduce to the thickness you like. Don't reduce the sauce too thick, as it cools the sauce will get thicker. If you like spicy add some green and red chilli. Fresh chilli gives a nice flavour to the finished dish. *Can also use chicken (breast or thigh meat) for this recipe. Use 1/2 cup of water to make the tamarind juice and cooking time is about 20 - 30 minutes. What a fantastic cook you are! I am so glad i stumbled upon your wonderful blog, and recipes! I would be sure to revisit and try some recipes soon!!!!! Great job! i am going to try this with chicken as we dont eat pork. i love tamarind in my food. your recipes always make me very hungry and wanting for spicy food!